Keeping snacks and lunches interesting can be tough sometimes especially on the go. One of the items that we rely on a lot is a thermos. A thermos lets us bring something nice and warm, especially on those chilly days, and cold outings. Let’s face it too…..kids get tired of sandwiches, well at least my kids do. The latest insulated food jar that I have tried out is the ChillWarmer FunJar. Here are the available colors of the ChillWarmer Funjar. “You’re Cute” is what you’ll say when you take one of our amazing FunJars home with you. The 16 oz double-walled insulated Funjar comes in a stylish blue or pink owl design aimed at younger children. The jar is also now available in a solid sky blue and stainless steel with sky blue lid for the older kids and/or their parents. This is great for the on-the-go family because it keeps food hot or cold all while keeping your family healthy as the jars are 100% BPA-Free. 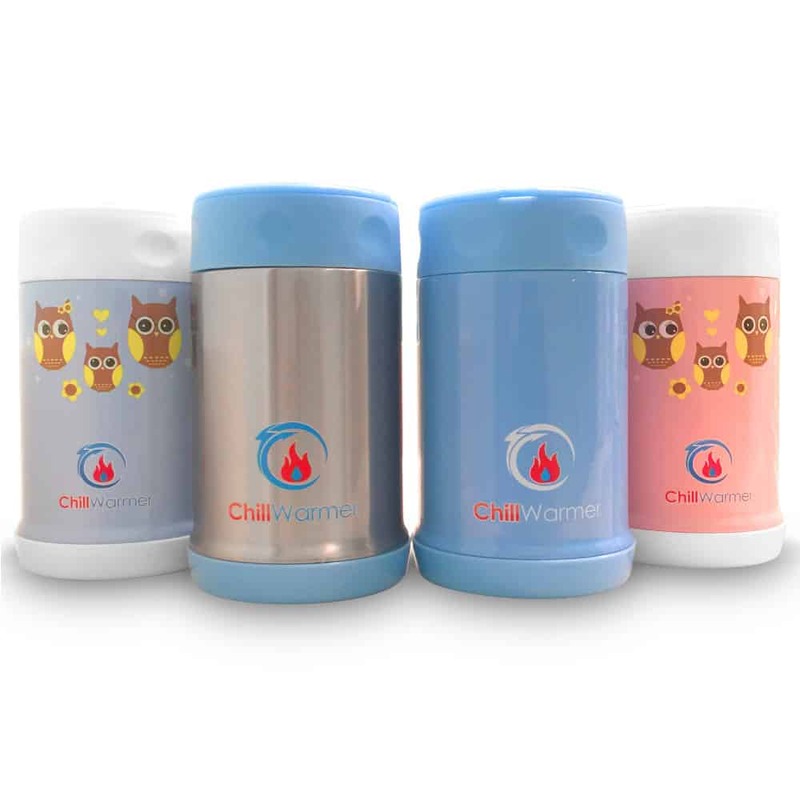 No need to worry about harsh chemicals leeching to your child or loved one’s food.food jar comes in a stylish blue or pink owl design aimed at younger children. The jar is also now available in a solid sky blue and stainless steel with sky blue lid for the older kids and/or their parents. This is great for the on-the-go family because it keeps food hot or cold all while keeping your family healthy as the jars are 100% BPA-Free. No need to worry about harsh chemicals leeching to your child or loved one’s food. Be Chill. Be Warm. Be Happy with one our FunJars today. The ChillWarmer keeps food hot for hours. I would recommend the ChillWarmer for moms to have to bring a warm meal when they are on the go. It is a great diaper bag insulated food jar. I really like the color options as well. We have the fun, pink owl FunJar. As a mom, the venting option is great. I do not recommend the ChillWarmer for young children. In my opinion, the chances of a young child being able to vent the FunJar is slim to nil. The 16 oz size is a great size for a mom and for a couple of kids sharing. I find the 16 oz size a bit too big for my 8 year old to take for lunch. She does not need that much warm food so it ends up half full and taking up a large portion of her lunch bag. I would like to see a ChillWarmer in a smaller size for elementary level children’s lunches. The 16 oz ChillWarmer is a great size for middle school kids and up, but I would love to see cooler colors as the current selection does not appeal to my middle school girl or my even older son. My middle school girl loves bringing a warm lunch. The silver ChillWarmer would be a great one for her out of the selection. She would love to see other colored bottoms and lids though. Let’s get down to what is important though……the ChillWarmer FunJar is BPA free as per the company. That is of course the most important thing. Next is the fact that it keeps the food warm longer than I bet you could ever need. The size at 16 oz, is a great size for moms and their on the go snacks especially when we want to share. In comparison to other insulated food jars that I have seen, the ChillWarmer FunJar is competitively priced and comes with a lifetime warranty so no worries if something happens…..just contact the company an they will look after you. You can order the ChillWarmer FunJar online on their website. To find our more about ChillWarmer and their line of products, make sure to visit them here….